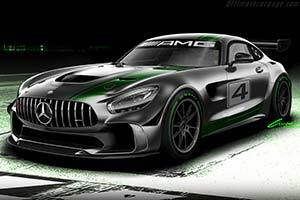 The AMG Customer Sports involvement keeps growing continuously: the latest element is the development of a race car to GT4 regulations. At the occasion of the end-of-season celebration 2016 (Saturday, 3 December), Tobias Moers, Chairman of the Management Board of Mercedes-AMG GmbH gave customer teams and drivers a first preview of the new Mercedes-AMG GT4. The Mercedes-AMG GT R that was presented this year is the basis for the development of the new race car. The top athlete in the Mercedes-AMG portfolio has excellent characteristics for motorsport purposes. Like with the AMG GT3 race car, particular user-friendliness and an excellent level of safety will be highly important goals during the development process of the new member of the AMG motorsport family. Tobias Moers, Chairman of the Management Board of Mercedes-AMG GmbH: "The development of the Mercedes-AMG GT4 is another important step in the continuing expansion of our Mercedes-AMG motorsport programme. The excellent feedback of our Customer Sports teams concerning the AMG GT3 and the increasing interest for GT4 race cars strengthened us in our decision. We are delighted to address an even larger target group of amateur and professional drivers and teams in the future with it."